One of the things that distinguishes Marvel Comics from its competitors is that most of the stories they tell take place in real-world locations. Spider-Man doesn't hang out in “Star City,” or some other generically named fill-in location—he’s a proud resident of New York, New York. The X-Men operate a few miles upstate, in Westchester County. And it’s not just the Empire State that gets superpowered protection—even Milwaukee has its own super team, The Great Lakes Avengers. That reliance on real-world locations helps to ground the escapades of Marvel’s larger-than-life characters. Sure, the Fantastic Four may jet off to the Negative Zone every other month, but they still call New York’s Baxter Building their home. And Hawkeye is an Avenger, yes, but he still has to deal with the tenants in his apartment building. 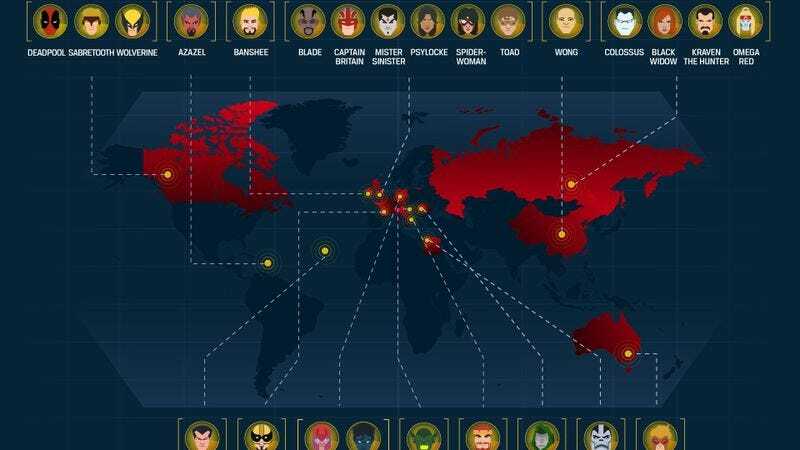 If you want an illustration of Marvel’s dedication to real-world geography, take a look at this map produced by real estate blog Movoto, showing the birth locations of 75 Marvel characters. While a few have their origins in made-up places—Reed Richards hails from the fictional Central City, California, and his rival, Namor, was born in Atlantis—the vast majority were born in cities you could drive or fly to today. In terms of demographics, New York unsurprisingly dominates the list, with almost a third of the listed heroes calling it home. And continent-wise, almost everyone comes from North America, Europe, and Asia, with ancient Egyptian Apocalypse as the only representative of Africa, and zero heroes or villains originating from anywhere in Central or South America. You can find an interactive version of the map, with cities of origin and characters’ first appearances, here.